TOLEDO, Oh. – My newest piece in the New York Times focuses on globalization that’s come full circle in a small Midwest city. Before it became known as the Marina District, the 128 acres of tall grass, and piled dirt on the Maumee River here was the place where the Acme coal-fired power plant once belched thick black smoke before it was decommissioned in 1994 and became one of the city’s most prominent eyesores. Right next to the big riverfront parcel is a 66,500-square-foot formerly city-owned dining and entertainment complex, The Docks, that for years after it was built in 1996 was among Toledo’s most popular destinations. But the Great Recession hit this northwest Ohio manufacturing center hard, and earlier this year two of the five restaurants closed, leaving hundreds of thousands of dollars in unpaid rent and lost tax revenue. In short, the open space along the east bank of the Maumee River bounded by Front Street, Main Street, and Interstate-280 looked to be as difficult a place to develop as any urban site in the Midwest. That is until two real estate developers from China, personally recruited late last year by Mayor Mike Bell and his staff, took one look last fall during a reciprocal visit to this city of 287,000 residents and saw an opportunity. 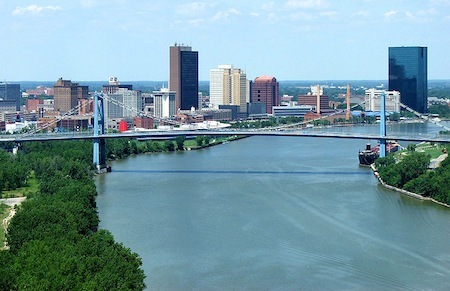 On March 18, the two investors, Yuan Xiaohona and Wu Kin Hung, closed on the $2.15 million purchase of The Docks and the surrounding five acres of Maumee River waterfront. In an interview Mayor Bell, a 56-year-old independent elected in 2009, said he and other city leaders are convinced the deal is the first step toward a much larger project: the sale of the adjoining 69 acres to Ms. Yuan and Mr. Wu, who said in a signed memorandum in February that they intend to build a new riverfront residential, office, retail, and entertainment district. See more here at the New York Times.